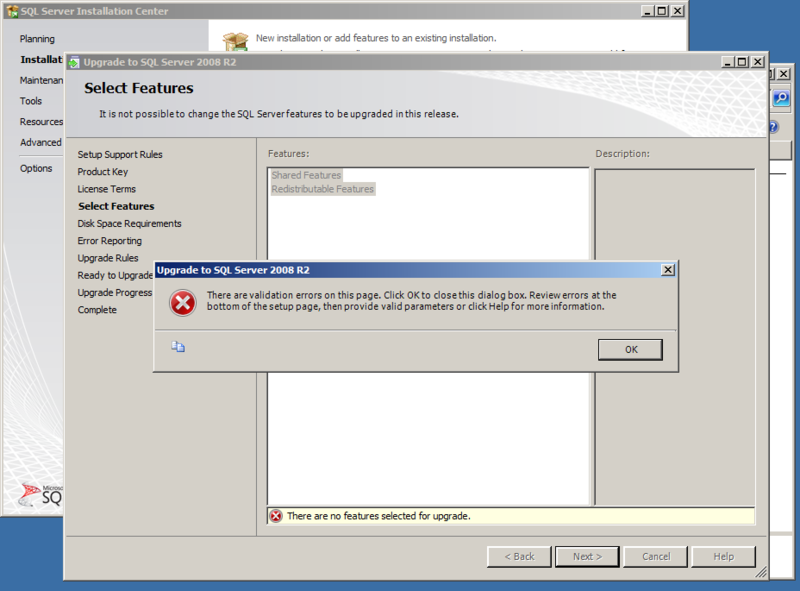 SQL Server Upgrade error: It is not possible to change the SQL Server features to be upgraded in this release. Validation errors. There are no features selected for upgrade. On a recent project I was asked to “upgrade” a licensed SQL Server 2008R2 Standard Edition to SQL Server 2008R2 Enterprise Edition. I have done this multiple times with no issues. The “kicker” was that the upgrade required a 48-hour turnaround time but no installation media for SQL Server Enterprise was going to be available in that same timeframe due to a delay in the procurement process. In order to meet project requirements and gain some time, a team member suggested we go ahead and do the “upgrade” using a downloaded copy of SQL Server 2008R2 Evaluation Edition since Evaluation Edition contains all the Enterprise features that were required. Once the installation media for SQL Server 2008R2 Enterprise arrived, we were to simply upgrade the Evaluation Edition to Enterprise Edition. My immediate response was that going from a licensed edition to an evaluation edition was not possible. It is not a “natural” upgrade path and is actually considered a “downgrade” as you are going from a licensed edition to an unlicensed edition. As a professional I had to back this statement up with official Microsoft documentation. As a geek no matter what the documentation said I had to try it myself to see what happened. So I did both. A quick search of Books on Line on SQL Server 2008R2 led me to the following MSDN article titled “Version and Edition Upgrades” (http://msdn.microsoft.com/en-us/library/ms143393(v=sql.105).aspx) . This article is great as it outlines all the supported upgrade scenarios for all versions and editions of SQL Server. A quick scroll towards the bottom shows that the only two upgrade paths supported for Standard Edition is Enterprise and Datacenter. As a matter of fact this article shows that there is no support going from any other edition to Evaluation Edition. Additionally, there are a couple of footnotes at the bottom. An important footnote to take a look at is footnote No. 2. Although the statements in footnote No. 2 are within the context of failover clusters, some of them also apply to stand-alone installations. In this footnote it is clearly stated that SQL Server 2008R2 Standard to SQL Server 2008R2 Evaluation upgrade is not supported. Upgrade SQL Server 2008R2 Standard Edition to SQL Server 2008R2 Evaluation Edition using the Upgrade Setup Wizard from Installation Center. In summary, you cannot upgrade from a licensed SQL Server edition to SQL Server Evaluation Edition. It is perfectly possible though, to upgrade from SQL Server Evaluation Edition to other licensed SQL Server editions. For more details on the supported upgrade paths refer to MDSN article: http://msdn.microsoft.com/en-us/library/ms143393(v=sql.105).aspx.